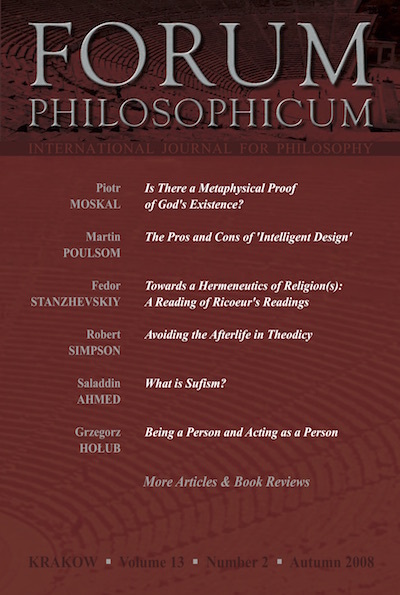 The papers in the issue: Piotr Moskal, “Is There a Metaphysical Proof of God's Existence?”; Martin Poulsom, “The Pros and Cons of ‘Intelligent Design’”; Fedor Stanzhevskiy, “Towards a Hermeneutics of Religion(s). A Reading of Ricoeur's Readings”; Robert Simpson, “Avoiding the Afterlife in Theodicy. Victims of Suffering and the Argument from Usefulness”; Saladdin Ahmed, “What is Sufism?”; Jarosław Paszyński, “Weisheit Gottes nach Thomas von Aquin”; Grzegorz Hołub, “Being a Person and Acting as a Person”; Henryk Machoń, “Tertium non datur? Der Streit zwischen Idealismus und Dogmatismus in Fichtes Versuch einer neuen Darstellung der Wissenschaftslehre”; Kazimierz Rynkiewicz, “Eine Skizze der Ontologie der Welt und des Menschen bei Wittgenstein und Ingarden”; Robert Grzywacz, “En quel sens la fiction possède-t-elle une fonction cognitive? Le texte à la jonction entre le langage poétique vif et I'action sensée selon P. Ricoeur”; Michael-John Turp, “Naturalized Epistemology and the Normative”; Danuta Ługowska, “Evolutionary Psychology as the Contemporary Myth”; Jan-Kyrre Berg Olsen, “Metaphysics and Time”.